I have only 30 days before my life support system fails me and I succumb to this toxic oxygen. Fortunately, the Pikmin are tireless in their efforts to help. 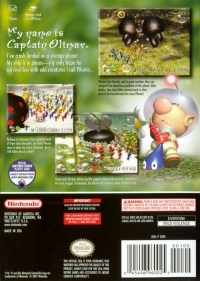 04-19-2016 desocietas Box Text My name is Captain Olimar. I've crash-landed on a strange planet. 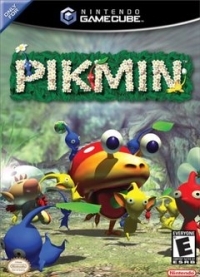 My ship is in pieces-my only hope for survival lies with odd creatures I call Pikmin... Pikmin fight fiercely, and in great numbers they can vanquish the monstrous predators of this planet. After battles, they tote fallen enemies back to their nests to be transformed into more Pikmin! Perhaps it is because I have plucked each of them from the earth, but these Pikmin seem to obey my every command. Up to 100 follow me at a time! I have only 30 days before my life support system fails me and I succumb to this toxic oxygen. Fortunately, the Pikmin are tireless in their efforts to help. 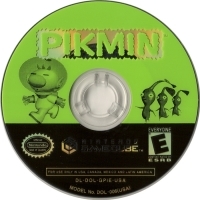 This is a list of VGCollect users who have Pikmin in their Collection. This is a list of VGCollect users who have Pikmin in their Sell List. This is a list of VGCollect users who have Pikmin in their Wish List.